Home/Blog/The Importance of Having the Right Feature Step. A staircase can be one of the most unique elements of your home. 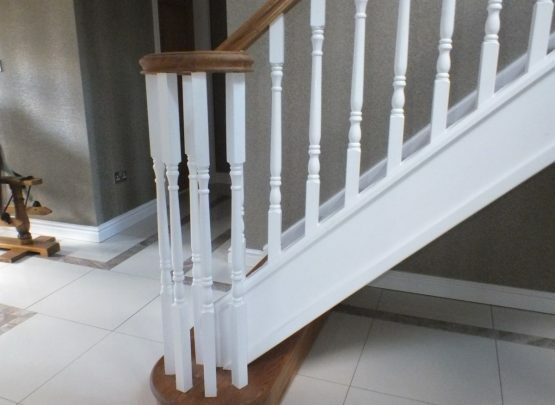 No two staircases are the same, with the size, materials, balustrades, finishing newel posts and even the finish under the stairs being unique. One of the most important parts of every staircase and something that can truly make yours stand out, are the feature steps. These steps differentiate themselves from the rest of the steps and can have different shapes, colours, materials and can even interact differently with the rest of the stairs. What is the function of a feature step? A feature step acts as a way to improve the flow into adjoining rooms when using a staircase as you can begin to change direction, before actually exiting the stairs. This is because when you add a feature step, you move the final newel post back, leaving no balustrade at the bottom of the stairs. This may sound like a silly design feature that saves 0.1 of a second of your day, but in fact it actually makes moving around your home feel much more natural. The effect of moving the newel back is limited to the final two steps, this is due to staircase regulations. Adding contrast to a staircase. One of the most important aspects of any interior design project is creating the contrasting colour schemes, that aren’t overpowering, but feel natural and encourage progression. 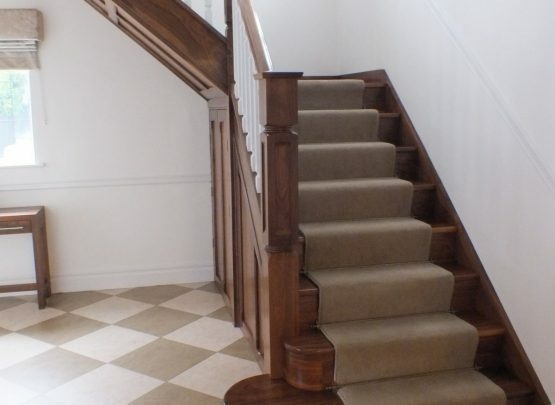 One of the ways you can do this on a staircase is by having a hardwood feature step, on a carpeted staircase. A hardwood step also acts as a boundary between your flooring and your stairs, with a neutral toned carpet and a light coloured floor, the step eases the transition between the staircase and the flooring. Types main of feature steps. There are two main types of feature steps, bullnose and curtail. With a bullnose meeting into the front of newel post and a curtail wrapping round into the side of a newel post. These can be combined by having a curtail on the bottom and a smaller bullnose on top. This combination offers the best possible combination and allows for the most flow between rooms. To see the different types of steps look at our Staircase Glossary. Getting a truly bespoke step. Even though you can get a great looking staircase with the standard types of step, in order to get the most unique possible staircase you can design your own feature step. 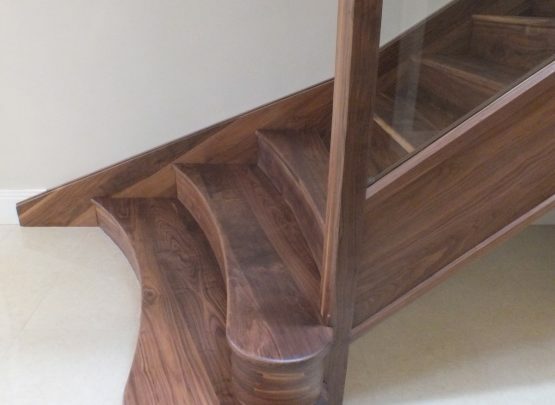 In order to get some inspiration when it comes to having a unique feature step, have a look at our Staircase Gallery to get some inspiration.